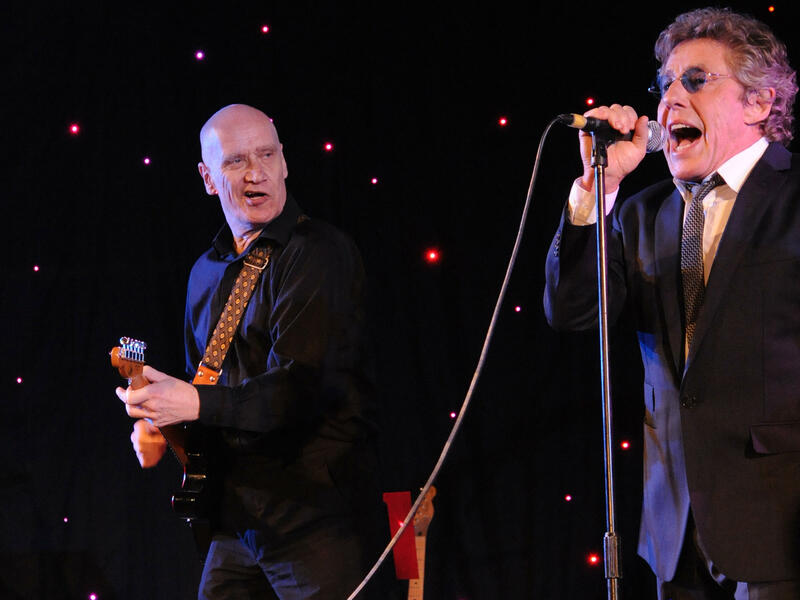 Wilko Johnson (left) and Roger Daltrey play a benefit for Pancreatic Cancer UK in London. Wilko Johnson is better known in the U.K. than he is here in the States. Over there, the band he formed in 1971, Dr. Feelgood, is a big deal. The band's style is simple and blues-based, yet Johnson insists it's been quite influential. "I think it's true to say the whole punk generation watched Dr. Feelgood," Johnson says. "We did have that influence." A few years back, Johnson found himself at a music awards show reminiscing about the good old days with another famous British rocker, Roger Daltrey of The Who. "So we said, 'Let's make a record,' " Daltrey says. "And we kind of threw it around a bit and talked a lot about doing it and never got around to it." But things changed when Johnson got a severe and inoperable form of pancreatic cancer. In January 2013, he was given less than a year to live. "I wasn't freaked out when the guy told me," Johnson says. "I went out the hospital in this beautiful winter's day, the trees against the sky and that and I just felt so elated and just thinking, 'You're alive, you're alive.' "
Johnson opted against chemotherapy, deciding to just let the cancer take its course. Soon after, news of his diagnosis began to spread. When Daltrey heard, he called Johnson immediately. "You know Wilko," Daltrey says, " 'Let's not worry about what we're going to record, let's just go and record anything!' The most important thing of all if you have a year to live is to have some fun." At first, Johnson envisioned recording covers of American soul hits from the 1960s. "But under the circumstance," Johnson says, "when we finally got to record it, I'm thinking, 'Right, well, this is the last thing I'll do. I'll have a bit of a retrospective of my songs.' "
The two recorded Going Back Home in a mere eight days, which Daltrey says is one reason the album is so special: "A lot of today's music is made ponderously where people dissect it and they spend hours overdubbing and all this stuff. We did it very simply and I think that's reflected on this album." Daltrey thinks the album's title track says it all: The experience captured the spirit of going back to the vitality they had four decades ago. "There's a 70-year-old singer and a dying guitarist; it's got so much energy, it's ridiculous!" Daltrey says, laughing. The album did remarkably well in both the U.K. and the U.S. It was voted album of the year by Classic Rock magazine. So the duo decided to take the show on the road, including a performance at London's Royal Albert Hall. "I've had many experiences of standing onstage in front of audiences and feeling that this could be the last time," Johnson says, laughing. "It's quite a wonderful feeling — actually very, very intense." But then something odd happened. Johnson didn't die. The doctors were stumped, so they ordered a new round of tests and determined they might just be able to remove his tumor. Last spring, Johnson underwent a major surgery that left him, he says, cancer-free. "My body is getting better and better," Johnson says, "but my mind is still finding it hard to adjust to the idea that the future is once again an indefinite thing." Johnson says he hopes that future will include a tour to North America — he hasn't been to the U.S. since the 1970s. Daltrey is also optimistic about what lies ahead. "He's got a long way to go and he'll be a Type 1 diabetic for the rest of this life," Daltrey says. "But who knows? Maybe there's a Part 2 to this record. I hope that there is." It's common practice these days for musicians to give a farewell tour before heading into retirement - or not. Nearly two years ago, British guitarist, Wilko Johnson, chose to launch his farewell tour, but his motivation was a bit different. He'd been told he had 10 months to live. As part of our series, The Ones That Got Away, stories we didn't get around to covering last year, Alex Cohen of member station KPCC brings us Johnson's story. ALEX COHEN, BYLINE: Wilko Johnson is better known in the UK than he is here in the States. Over there, the band he formed in 1971, Dr. Feelgood, is a big deal. WILKO JOHNSON: (Singing) I saw you out the other night. I saw somebody hold you tight. Roxette, I wonder who it could be. COHEN: The band's style is simple and blues-based, yet Johnson insists it's been quite influential. JOHNSON: I think it's true to say that the whole punk generation was just full up with people who had seen Doctor Feelgood and kind of got off on that idea. So, yeah, we did have that influence. COHEN: A few years back, Johnson found himself at a music awards show, reminiscing about the good old days with another famous British rocker, Roger Daltrey of The Who. ROGER DALTREY: So we said, well, yeah, come on, let's make a record. And we kind of threw it around a bit and talked a lot about doing it and never got around to it. JOHNSON: But then the whole thing changed when - after I got cancer. COHEN: Johnson didn't just get cancer. Doctors told him he had a severe and inoperable form of pancreatic cancer. In January 2013, he was given less than a year to live. JOHNSON: I wasn't freaked out when the guy told me. And when I went out of the hospital in this beautiful winter's day, the trees against the sky, and I just felt so elated, and just thinking - you're alive, you're alive. COHEN: Johnson opted against chemotherapy. He decided to just let the cancer take its course. Soon after, news of his diagnosis began to spread. When Roger Daltrey heard, he called Johnson immediately. DALTREY: And said, you know, Wilko, let's what's not worry about what we're going to record. Let's just go and record anything. You know, the most important thing of all if you've got a year to live is to have some fun. COHEN: At first, Wilko Johnson envisioned recording covers of American soul hits from the 1960s. JOHNSON: But under the circumstance, and when we finally got to record it, I'm thinking - right, well, this is the last thing I will do. I'll have a bit of a retrospective of my songs. DALTREY: (Singing) Watch out if you think you're going places. People sometimes take you by surprise. And if you ain't got 50 different faces, you've got to be a master of disguise. Oh, watch out. You got to find out, find out for yourself, boy, what's going on. COHEN: The two recorded "Going Back Home" in a mere eight days, which, Roger Daltrey says, is one reason the album is so special. DALTREY: A lot of today's music is made ponderously, where people, you know, dissect it. And they spend hours over-dubbing and all this stuff. And I think an awful lot of what we loved about the rock music when we were young - we did it very simply. And I think that's reflected on this record. DALTREY: (Singing) I want to live the way I like. Sleep all the morning. Go and get my fun at night. Yeah, things ain't like that here - working just to keep my payments clear. I bought a brand-new motor and I'm waiting on a loan, so I can fill 'er up and start her, then I'm going back home. COHEN: Daltrey thinks the album's title track, "Going Back Home," says it all. The experience captured the spirit of going back to the vitality they had four decades ago. DALTREY: There's a 70-year-old singer and a dying guitarist (laughter). It's got so much energy. It's ridiculous. COHEN: The album did remarkably well, both in the UK and the U.S. It was voted album of the year by Classic Rock Magazine, so the duo decided to take the show on the road, including a performance at London's Royal Albert Hall. JOHNSON: I've had many experiences of standing on stage in front of audiences and feeling that, you know, this could be the last time. And it's quite a wonderful feeling actually - very, very intense. COHEN: But then, something odd happened. Johnson didn't die. The doctors were stumped, so they ordered a new round of tests and determined they might just be able to remove his tumor. Last spring, Johnson underwent a major surgery that left him, he says, cancer free. JOHNSON: My body is getting better and better, but my mind is still finding it hard to adjust to this idea that the future is once again an indefinite thing. I mean, I spent all that time believing that I had no future. COHEN: Johnson says he hopes that future will include a tour to North America. He hasn't been to the U.S. since the 1970s. Roger Daltrey is also optimistic about what lies ahead. DALTREY: He's got a long way to go, and he'll be a Type I diabetic for the rest of his life, but who knows? Maybe there's a part two to this record. I hope there is. COHEN: For NPR News, I'm Alex Cohen. DALTREY: (Singing) Caught in my mirror, the sun stares with his one crazy eye from a burning blue sky, and we walked on and on. Darling, you turned 21. Transcript provided by NPR, Copyright NPR.